This newspaper article was found amongst some old papers, it was published in the Holyhead and Anglesey Mail in February 1976. The first and last of the line up are still working for the company. Also by coincidence the current Kilmore Quay lifeboat was recently in the yard for some minor repairs. The text under the photo reads - Mrs Meade of the Holyhead Boatyard has received a letter of gratitude from Mr Nigel Dexin, one of the directors of the Royal National Lifeboat Institution. 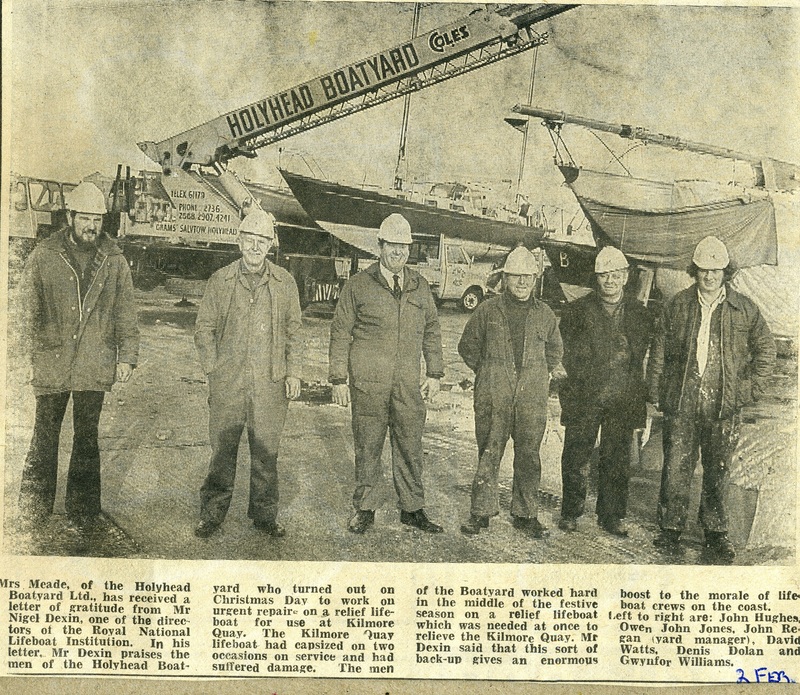 In his letter Mr Dexin praises the men of the Holyhead Boatyard who turned out on Christmas Day to work on urgent repairs on a relief lifeboat for use at Kilmore Quay. The Kilmore Quay Lifeboat had capsized on two occasions on service and had suffered damage. The men of the Boatyard had worked hard in the middle of the festive season on a relief lifeboat which was needed at once to relieve the Kilmore Quay. Mr Dexin said "this sort of back-up gives an enormous boost to the morale of the lifeboat crews on the coast". Left to right are John Hughes, Owen John Jones, John Regan (yard manager), David Watts, Denis Dolan and Gwynfor Williams.